Joystickers is a street art project. During the sound art festival Zeppelin 03 we presented this project. 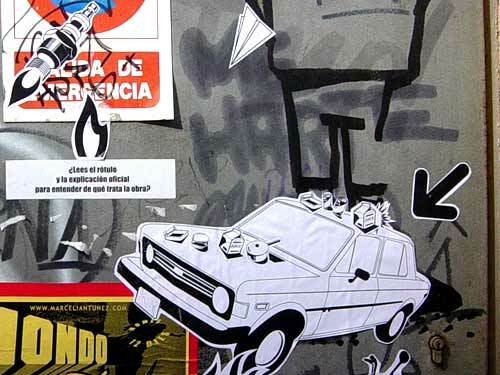 Joystickers was about the illustration of urban soundsacapes made by stickers with iconic images. (see results here). We call for the continuation of this project focusing on the graphic aspect of it and its relation with the environment and architecture, turning it into an open project for anyone that wants to participate without mattering the place where they are. 1. Download the JOYSTICKERS files. 2. Open the files in any vectorial drawing application (illustrator. 3. Select the images that you want to choose in your composition any scale them to any size that you want. 4. Print your selection , we recommend a laser printer because inkjet prints are not water resistant. Another possibility is is to print it with a inkjet printer and then photocopy the images (this way you can multiply them and you use less ink!). 5. If you don’t have sticker paper, the best thing is to print on regular paper and then buy wall paper glue. 6. Choose your wall, bring your glue, your papers and a brush. Put some glue on the wall and on the back side of the paper, then place your Joystickers. When the whole composition is ready pass the brush over the paper to make sure that they stick well to the wall. 7. Send us a picture of your composition, we will be publishing them here. The idea is that we keep on loading more vectorial drawings (.eps) and in this way, expanding the archive. So if you have vectorial images that you want to share send them to info@jstk.org, we will publish them here.